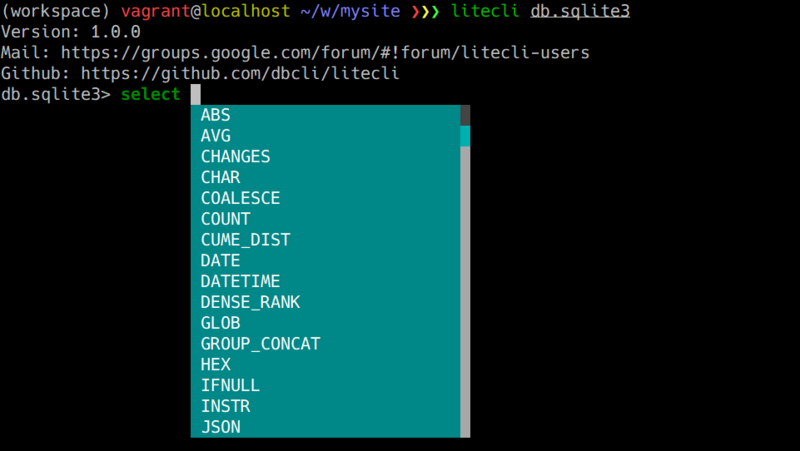 A SQLite terminal client with auto-completion and syntax highlighting. -V, --version           Output litecli's version. -D, --database TEXT     Database to use. -R, --prompt TEXT       Prompt format (Default: "\d> "). -l, --logfile FILENAME  Log every query and its results to a file. --liteclirc FILE        Location of liteclirc file. result is wider than the terminal width. -t, --table             Display batch output in table format. --csv                   Display batch output in CSV format. --warn / --no-warn      Warn before running a destructive query. -e, --execute TEXT      Execute command and quit. # Save a new favorite query. # List all favorite queries. # Run a favorite query. # Delete a favorite query.